Meg Whitman is the CEO of HP. 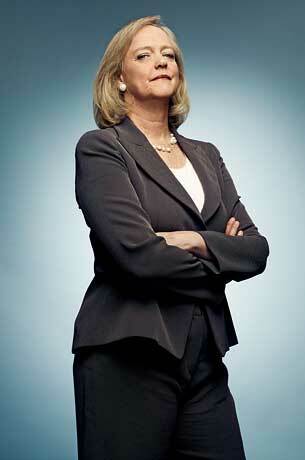 Meg Whitman is one of America’s most successful businesswomen. She has made the rounds for a number of well-known companies, including DreamWorks, The Walt Disney Company, Procter & Gamble, Hasbro, and HP. She’s even tried her hand in politics, having made a 2010 run for Governor of California, which she eventually lost to opponent Jerry Brown. Whitman was born in Long Island, New York, moving on after graduating high school to study at Princeton University. She initially wanted to be a doctor and began her studies with focuses in mathematics and science, but later made the switch to economics. After receiving her B.A. with honors from Princeton, Whitman attended and graduated with an M.B.A. from Harvard Business School. Starting out her career as a brand manager at Procter & Gamble, Whitman quickly worked her way up through the ranks. Ten years into her career, she accepted the position of Vice President of Strategic Planning at The Walt Disney Company. Her duration at Disney was short, though, as she was appointed CEO and President of Florists’ Transworld Delivery just a few years later. In 1997, Whitman became Hasbro’s Playskool Division General Manager, managing and marketing the Playskool and Mr. Potato Head brands. She was also involved in bringing the hit children’s show, Teletubbies, to the United States from the U.K.
Meg Whitman really made her mark on the corporate world when she became CEO of eBay in 1998. It had just 30 employees and was bringing in annual revenue of about $4 billion. Whitman restructured the entire executive team and the websites underlying organization. She took the company public eventually, and by the time she left her post in 2007 the company had around 15,000 employees and $8 billion in annual revenue. After leaving eBay, Whitman became involved in politics. She was a supporter of Mitt Romney’s 2008 bid for the presidency, though he eventually removed himself from the race to endorse John McCain. In 2010, Whitman ran for Governor of California against Democrat Jerry Brown. Her campaign focused on bringing three things to California: more jobs, less government spending, and K-12 educational reform. She was ultimately defeated for the position. In January 2011, Whitman joined HP’s board of directors and later that year became its CEO. She again supported former Governor Mitt Romney in his 2012 race for the presidency, with rumors speculating that she would become a cabinet member if Romney were elected. Today, Meg Whitman is worth an estimated $1.9 billion. She is a self-made woman who has an enviable résumé of past jobs, which makes us wonder what the next twenty years will bring for her. Likely great things.